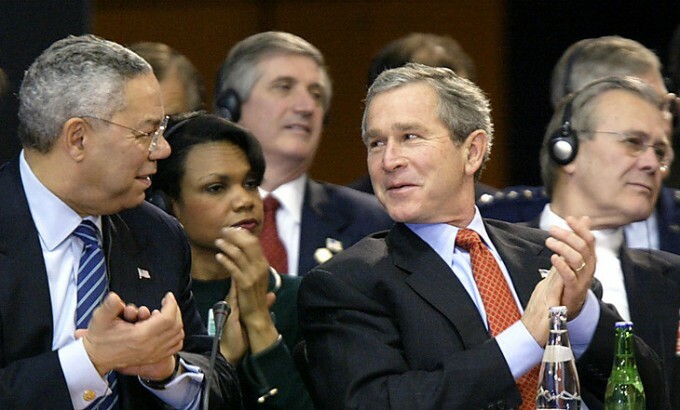 Iraq WMD: Does the New York Times probe reflect what administration officials claimed? “During the long occupation, American troops began encountering old chemical munitions in hidden caches and roadside bombs. Typically 155-millimeter artillery shells or 122-millimeter rockets, they were remnants of an arms program Iraq had rushed into production in the 1980s during the Iran-Iraq war. A New York Times investigation into military casualties of Iraq’s abandoned chemical weapons has inspired some commentary that this proves that the George W. Bush administration’s assertions about Iraq’s WMD programs turned out to be correct. But note that the Times story says that these weapons were manufactured before the 1991 invasion of Kuwait. Indeed, from 1991 to 1998, U.N. weapons inspectors uncovered Iraq’s secret biological weapons program and a project to enrich uranium — and then eliminated vast stockpiles of chemical and biological agents. Such pre-1991 chemical-weapons shells (often empty) were found by U.N. weapons inspectors just before the 2003 invasion of Iraq by the United States. The Bush administration, by contrast, staked its WMD claims on an active, on-going program that was restarted after the Kuwait conflict. Iraq largely has rebuilt missile and biological weapons facilities damaged during Operation Desert Fox and has expanded its chemical and biological infrastructure under the cover of civilian production…. Although Saddam probably does not yet have nuclear weapons or sufficient material to make any, he remains intent on acquiring them. Baghdad has begun renewed production of chemical warfare agents, probably including mustard, sarin, cyclosarin, and VX. Its capability was reduced during the UNSCOM inspections and is probably more limited now than it was at the time of the Gulf war, although VX production and agent storage life probably have been improved. Saddam probably has stocked a few hundred metric tons of CW agents. The Iraqis have experience in manufacturing CW bombs, artillery rockets, and projectiles, and probably possess CW bulk fills for SRBM warheads, including for a limited number of covertly stored, extended-range Scuds. All key aspects—R&D, production, and weaponization—of Iraq’s offensive BW [Biological Weapons] program are active and most elements are larger and more advanced than they were before the Gulf war. Iraq has some lethal and incapacitating BW agents and is capable of quickly producing and weaponizing a variety of such agents, including anthrax, for delivery by bombs, missiles, aerial sprayers, and covert operatives, including potentially against the US Homeland. Baghdad has established a large-scale, redundant, and concealed BW agent production capability, which includes mobile facilities; these facilities can evade detection, are highly survivable, and can exceed the production rates Iraq had prior to the Gulf war. Iraq maintains a small missile force and several development programs, including for a UAV that most analysts believe probably is intended to deliver biological warfare agents. The Iraqi regime has violated all of those obligations. It possesses and produces chemical and biological weapons. It is seeking nuclear weapons…. Surveillance photos reveal that the regime is rebuilding facilities that it had used to produce chemical and biological weapons. Every chemical and biological weapon that Iraq has or makes is a direct violation of the truce that ended the Persian Gulf War in 1991. Yet, Saddam Hussein has chosen to build and keep these weapons despite international sanctions, U.N. demands, and isolation from the civilized world…. Iraq could decide on any given day to provide a biological or chemical weapon to a terrorist group or individual terrorists. Alliance with terrorists could allow the Iraqi regime to attack America without leaving any fingerprints. Satellite photographs reveal that Iraq is rebuilding facilities at sites that have been part of its nuclear program in the past. Iraq has attempted to purchase high-strength aluminum tubes and other equipment needed for gas centrifuges, which are used to enrich uranium for nuclear weapons. If the Iraqi regime is able to produce, buy, or steal an amount of highly enriched uranium a little larger than a single softball, it could have a nuclear weapon in less than a year. It should come as no shock then, that since Saddam Hussein forced out the last inspectors in 1998, we have amassed much intelligence indicating that Iraq is continuing to make these weapons. One of the most worrisome things that emerges from the thick intelligence file we have on Iraq’s biological weapons is the existence of mobile production facilities used to make biological agents…. The trucks and train cars are easily moved and are designed to evade detection by inspectors. In a matter of months, they can produce a quantity of biological poison equal to the entire amount that Iraq claimed to have produced in the years prior to the Gulf War. Let’s look at one [slide]. This one is about a weapons munition facility, a facility that holds ammunition at a place called Taji. This is one of about 65 such facilities in Iraq. We know that this one has housed chemical munitions. In fact, this is where the Iraqis recently came up with the additional four chemical weapon shells. Here, you see 15 munitions bunkers in yellow and red outlines. The four that are in red squares represent active chemical munitions bunkers. How do I know that? How can I say that? Let me give you a closer look. Look at the image on the left. On the left is a close-up of one of the four chemical bunkers. The two arrows indicate the presence of sure signs that the bunkers are storing chemical munitions. The arrow at the top that says security points to a facility that is the signature item for this kind of bunker. Inside that facility are special guards and special equipment to monitor any leakage that might come out of the bunker. The truck you also see is a signature item. It’s a decontamination vehicle in case something goes wrong. Anyone who claims that the New York Times story vindicates George W. Bush-era claims of Iraq WMD automatically earns Four Pinocchios.